Objective statement: The objective statement is your first chance to catch the reader’s attention. Describe the type of position you are looking for in one or two sentences. Your description should include some keywords that match up with the job description of the position being applied for. Skills: The skills section is included near the beginning of the resume because it has the most important information. Outline your key skills and abilities with a focus on those related to the critical care position you are applying for. Don’t list all of your skills. Summarize your abilities in the areas the position calls for and list relevant skills you have in each area that are called for in the job criteria. Use bullet lists to list the skills as that draws the reader’s eyes. In the first couple of seconds scanning the resume an employer will see that you have those skills they need. Formal qualifications and certifications: List the school name, date graduated and the degree received for the institution where you received your nursing degree. Provide the state/states that you are licensed in to work as a RN and the date your RN license was issued. If required in your state, include your Advanced Cardiac Life Support (ACLS) Certification and your Pediatric Life Support (PALS) Certification. (These are good certifications to have even if not required). Employment history: List all previous nursing employment beginning with the most recent. Provide a summary of what your duties were in each job. If any duties are relevant to the position you are seeking, emphasize them. 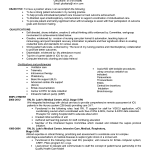 A professional nursing resume using this format emphasizes skills. Most applicants will have similar educations, so it is the skill sets that applicants possess that most interests the employer. 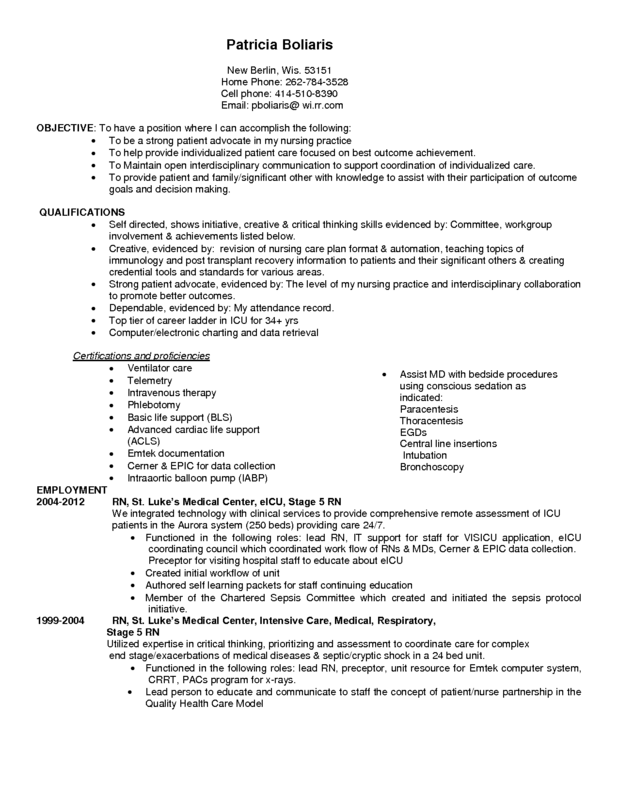 Have a look at our ER nurse resume example to draw even more fresh ideas! Does the resume present an overall professional appearance? Does the resume use bullet lists and other highlighting techniques to make the most important information stand out? Is all the important information included such as required certifications and skills? Is your objective statement supported by the information you provided? Is the resume written in the best format to effectively show off your abilities? Does the resume focus on specific skills and abilities you have that match the job description? You resume only has a few seconds to attract the attention of the employer and make an impression that will result in an interview, so it must be as near to perfect as you can make it. 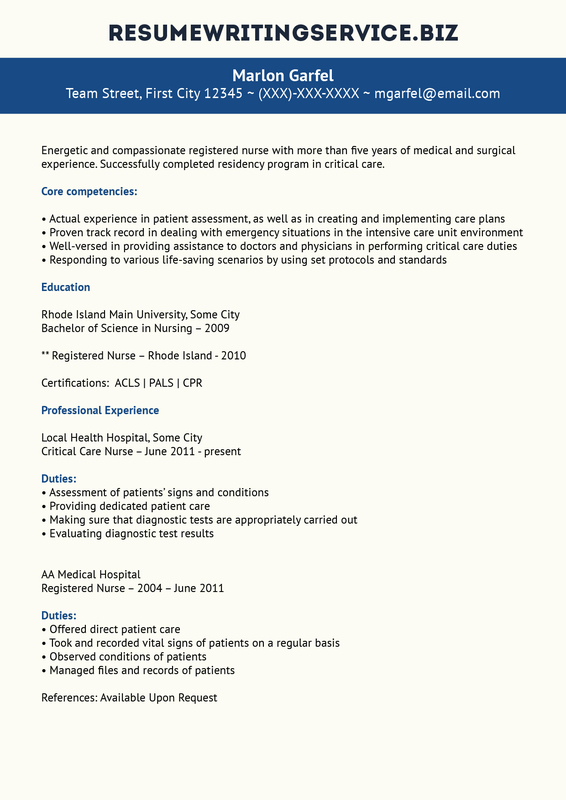 You can easily use these tips when creating your ICU nurse resume as well. The U.S. has approximately 2.8 million registered nurses and the Bureau of Labor Statistics includes critical care nurses as RNs as opposed to having a separate category for them. Wages for critical care nurses follow those of other RN’s fairly closely. The median wage for a RN is $69,790 or $33.55 per hour. The best paid ten percent of registered nurses make over $96,000 annually while the bottom ten percent earn around $45,000 which is pretty much how it breaks down for critical care nurses as well. Employment of critical care nurses is projected to grow 26 percent over the next 10 years, which is well above the average for all occupations and also above the average for all RNs. We offer outstanding assistance with your critical care nurse resume! Contact us now!